Goldman Sachs predicts a gold spike in the near term to $1800+, but eventual decline to about 1200 by 2018. Their view is that safe haven seeking behavior will reduce as economies heal and interest rates rise, and risk assets appreciate. In particular, they are concerned that when interest rates revert from negative real rates to positive real rates, the price of gold will experience strong negative pressures, which they feel will probably outweigh other factors that may produce positive price pressures. The Goldman view is still an outlier. They are not alone, but are in a growing minority of investors who are either skeptical about the potential for gold to maintain its rate of price appreciation, or that see other better opportunities. We would add that there is a discomforting level of broad retail interest in owning gold, and a media saturation level by gold marketing companies. There, of course, has been a chorus of objections to the Goldman forecast, including those who suggest that Goldman has a practice of recommending one thing to move a market, and then doing the opposite for themselves. Then, there are the arguments about gold as the anti-Dollar and the continuing debasement of the Dollar that lies ahead as a result of both ever expanding deficits and Fed easing and monetary base expansion. January 2011: Goldman forecasts a top in gold prices of around $1,750 an ounce, perhaps by the end of 2011. By September, the yellow metal had reached a high of just under $1,900 an ounce. November 2011: Having changed its tune to bullish, Goldman suddenly predicts a major push in gold prices. The bank upped its 12-month gold target to $1,930 an ounce. The price has been more or less flat since. May 2012: Goldman predicts that gold will advance to $1,840 an ounce within six months. At the time, gold had reached a 12-month bottom of less than $1,550 an ounce. While gold did advance over the ensuing six months, by early November it was below $1,700 – having never really flirted with the $1,800 mark. GLD is the largest gold bullion ETF (has more gold than all but a small number of country central banks). Its existence and the ease of access to, and holding of, gold is believed by some to be significantly responsible for the run up in the price of gold. If so, rotation of investor interest out of “safe haven” assets into other assets in an improving economy would take away an important gold demand component. This chart of GLD (priced virtually as 1/10 the price of gold) shows its flagging price since mid-2011. The chart begins on October 1, 2007 (effectively the S&P 500 stock market high prior to the 2008 crash). 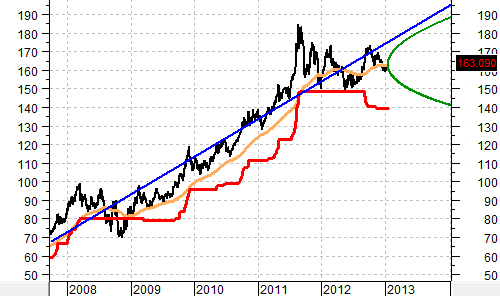 The blue line is a linear regression best fit trend line, extended to the end of 2013 — ending at 195 (~ gold 1950). The red line is a 20% (bear market) negative offset from the 1-year trailing high price — 139 (~ gold 1390). The tan line is the 200-day exponential moving average — 163 (~ gold 1630). The green parabolic line is the 90% probable price range through the end of 2013, based on the 1-year trailing volatility of GLD — high 188, low 141 (~ gold high 1880, gold low 1410. Gold cycle likely to turn in 2013; lowering gold price forecasts … We lower our 3-, 6- and 12-mo gold price forecasts to $1,825/toz, $1,805/toz and $1,800/toz and introduce a $1,750/toz 2014 forecast. While we see potential for higher gold prices in early 2013, we see growing downside risks. …Assuming a linear increase in US real rates back to 2.0% by 2018, as proxied by the 10-year US TIPS yield, we expect that gold prices will continue to trend lower over the coming five years and introduce our long-term gold price of $1,200/oz from 2018 forward. 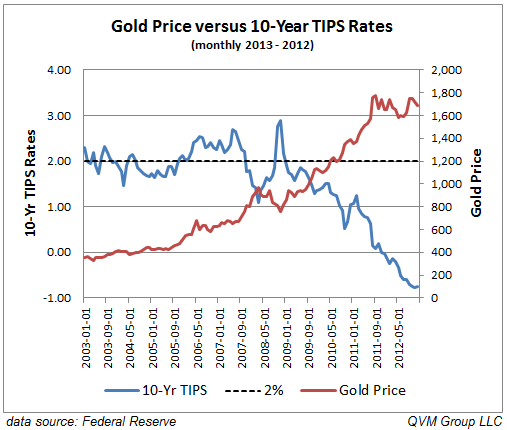 Here is a chart of the price of gold versus the rates on 10-year US TIPs referenced in the Goldman statement. The earliest data available from the Fed is as of 2003. Beyond real interest rates, fluctuations in the monetary demand for gold also exert an influence on gold prices. Our forecast currently embeds physical gold demand from ETFs and central banks growing in 2013 at the 2009-2012 pace, with ETF purchases slowing in 2014. In our forecast, this steady monetary gold demand helps slow the decline in prices over the coming years. Given the risk around this assumption, we also considered alternative paths for physical gold demand but found that, while not negligible, the impact of gold prices to stronger or weaker monetary demand for gold remains modest compared to the influence exerted by real rates and the Fed’s QE. As a result, it would require a significant further increase in monetary demand for gold to change our outlook for gold prices. While a very significant increase in monetary gold demand by EM investors and central banks could hold the potential for such a large impact, it is also worth noting that a decline in gold prices pushing ETF gold holdings sharply lower would in turn precipitate this fall in gold prices. Our framework for evaluating gold prices relates the real (inflation-adjusted) price of gold to real interest rates and the monetary demand for gold. 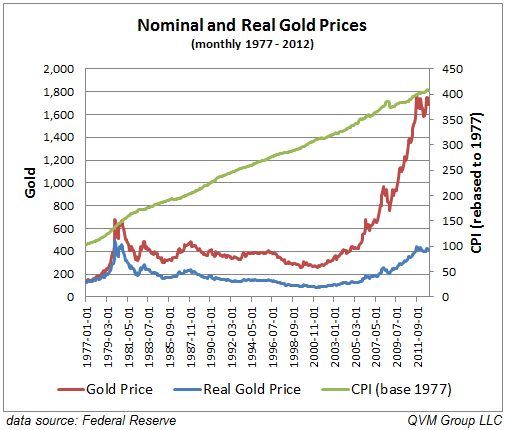 As a result, a higher rate of US inflation would inflate our forecasted gold price proportionally. For now, our economists view inflation above the Fed’s target as a low probability risk given: (1) inflation expectations have remained well anchored despite significant expansion of the Fed’s balance sheet, (2) the margin of economic slack will only gradually decline given their expected slow decline in unemployment, and (3) we further forecast that commodity prices will remain more stable than in prior years. Finally, even if higher inflation materializes, its impact on gold prices could be offset by: (1) US real interest rates rising more quickly than we anticipate if the economic recovery is accelerating, or (2) an end to the Fed’s aggressive balance sheet expansion if inflation expectations become unhinged. 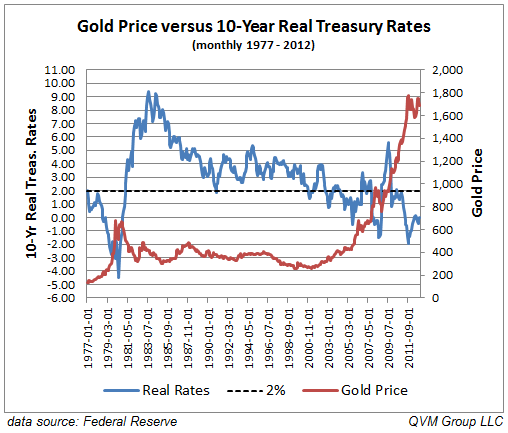 Here is a chart of gold versus 10-year real Treasury rates. The Fed has much longer rate histories for nominal rates, which we have adjusted here by CPI. It seems to generally support the thesis that gold is negatively reactive to negative real interest rates. Note the gold spike in the late 1970’s when real rates fell below 2%, followed by a decline when real rates rose above 2%, and then began a rise again as real rates fell below 2% again in the early 2000’s. Note these real rates are for current conditions, whereas the TIPS rates mentioned by Goldman are forward looking. This entry was posted on Sunday, January 20th, 2013 at 3:13 PM and is filed under Analysis, Data, Interesting Charts. You can follow any responses to this entry through the RSS 2.0 feed. Both comments and pings are currently closed.